Holo – is it me you’re looking for? 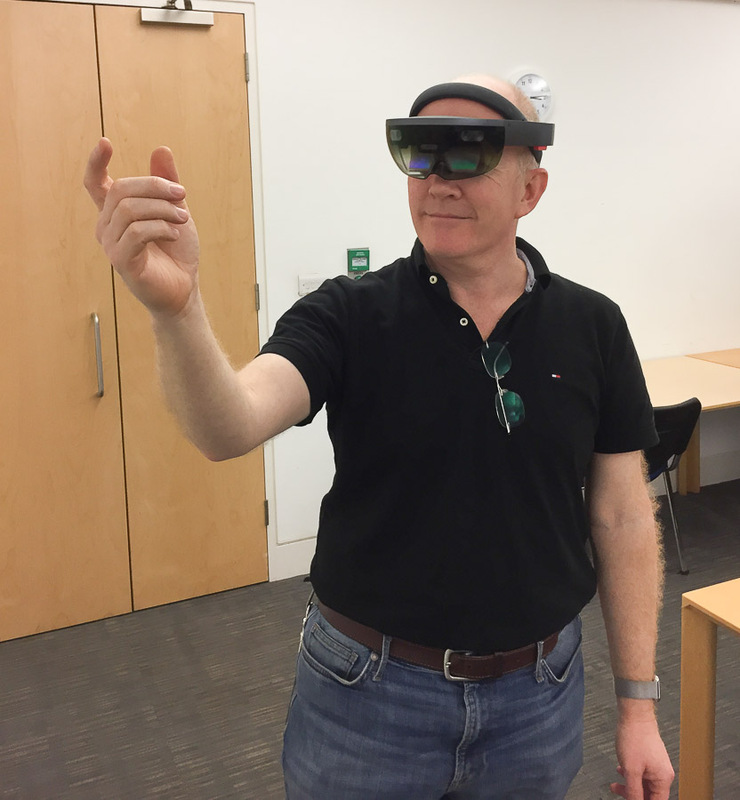 I got to have a good play with a Microsoft Hololens today. This is an augmented reality headset: you get to see your real-world surroundings, but with computer-generated overlays. 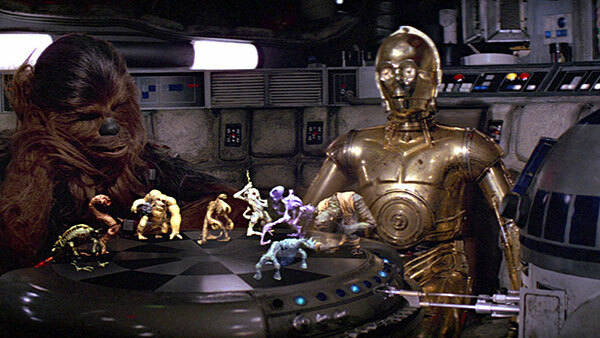 If you remember the holographic chess game in Star Wars, you’ve got the right idea, but the projections can be big and all around you, as well as small and on the table. It’s a very clever combination of a bright, retina-projecting display, the Kinect 3D-sensing technology which builds up a map of the room, good accelerometers and supporting hardware so there’s no noticeable lag, all built into a computer that is comfortable to wear and requires no attached cables. This isn’t primarily for games: imagine an architect walking around a building and being able to ‘see’ the pipes and wires behind the walls. A surgeon being able to walk around the 3D MRI scan of their patient and view it from different angles, possibly actually projected onto the patient’s body in the operating theatre. A remote technician being able to guide you through disassembling, fixing and reassembling some device, because they can see what you see, and point out things right in front of you… the possibilities are almost endless. This is version 1.0, of course, and it has some limitations — it won’t work very well outside, for example, because of the brightness of the ambient light and the difficulty of capturing a good model of the surrounding world. It’s available in restricted quantities, for about three thousand pounds apiece. The projected images only cover a limited field of your view: they are good and clear when you’re looking at them, but you don’t see them in your peripheral vision. And there are some things for which a VR headset is clearly superior, especially if you want to replace your existing environment completely. Despite all of this, it is great fun, and exceedingly well engineered, and the inclusion of the Kinect technology gives it a real edge over things like Google Glass, and gets rid of the problem of walking into walls and tripping over furniture that is an inconvenience of full VR headsets. Overall, it’s really quite impressive, and I predict that we’ll see quite a lot more of this in future. Nice photo – looks like they have integrated an analog clock on the back. So that onlookers know what time it is, presumably.